Can a mound of dirt represent the Buddha, the path to Enlightenment, a mountain and the universe all at the same time? It can if its a stupa. 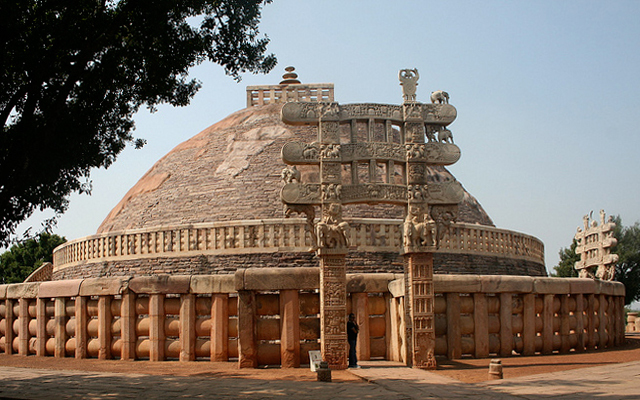 The stupa (“stupa” is Sanskrit for heap) is an important form of Buddhist architecture, though it predates Buddhism. It is generally considered to be a sepulchral monument—a place of burial or a receptacle for religious objects. At its simplest, a stupa is a dirt burial mound faced with stone. In Buddhism, the earliest stupas contained portions of the Buddha’s ashes, and as a result, the stupa began to be associated with the body of the Buddha. Adding the Buddha’s ashes to the mound of dirt activated it with the energy of the Buddha himself. Before Buddhism, great teachers were buried in mounds. Some were cremated, but sometimes they were buried in a seated, meditative position. The mound of earth covered them up. Thus, the domed shape of the stupa came to represent a person seated in meditation much as the Buddha was when he achieved Enlightenment and knowledge of the Four Noble Truths. The base of the stupa represents his crossed legs as he sat in a meditative pose (called padmasana or the lotus position). The middle portion is the Buddha’s body and the top of the mound, where a pole rises from the apex surrounded by a small fence, represents his head. Before images of the human Buddha were created, reliefs often depicted practitioners demonstrating devotion to a stupa. The ashes of the Buddha were buried in stupas built at locations associated with important events in the Buddha’s life including Lumbini (where he was born), Bodh Gaya (where he achieved Enlightenment), Deer Park at Sarnath (where he preached his first sermon sharing the Four Noble Truths (also called the dharma or the law), and Kushingara (where he died). The choice of these sites and others were based on both real and legendary events. According to legend, King Ashoka, who was the first king to embrace Buddhism (he ruled over most of the Indian subcontinent from c. 269 – 232 B.C.E. ), created 84,000 stupas and divided the Buddha’s ashes among them all. While this is an exaggeration (and the stupas were built by Ashoka some 250 years after the Buddha’s death), it is clear that Ashoka was responsible for building many stupas all over northern India and the other territories under the Mauryan Dynasty in areas now known as Nepal, Pakistan, Bangladesh, and Afghanistan. One of Ashoka’s goals was to provide new converts with the tools to help with their new faith. In this, Ashoka was following the directions of the Buddha who, prior to his death (parinirvana), directed that stupas should be erected in places other than those associated with key moments of his life so that “the hearts of many shall be made calm and glad.” Ashoka also built stupas in regions where the people might have difficulty reaching the stupas that contained the Buddha’s ashes. The practice of building stupas spread with the Buddhist doctrine to Nepal and Tibet, Bhutan, Thailand, Burma, China and even the United States where large Buddhist communities are centered. While stupas have changed in form over the years, their function remains essentially unchanged. Stupas remind the Buddhist practitioner of the Buddha and his teachings almost 2,500 years after his death. For Buddhists, building stupas also has karmic benefits. Karma, a key component in both Hinduism and Buddhism, is the energy generated by a person’s actions and the ethical consequences of those actions. Karma affects a person’s next existence or re-birth. For example, in the Avadana Sutra ten merits of building a stupa are outlined. One states that if a practitioner builds a stupa he or she will not be reborn in a remote location and will not suffer from extreme poverty. As a result, a vast number of stupas dot the countryside in Tibet (where they are called chorten) and in Burma (chedi). Buddhists visit stupas to perform rituals that help them to achieve one of the most important goals of Buddhism: to understand the Buddha’s teachings, known as the Four Noble Truths (also known as the dharma and the law) so when they die they cease to be caught up in samsara, the endless cycle of birth and death. Once individuals come to fully understand The Four Noble Truths, they are able to achieve Enlightenment, or the complete knowledge of the dharma. In fact, Buddha means “the Enlightened One” and it is the knowledge that the Buddha gained on his way to achieving Enlightenment that Buddhist practitioners seek on their own journey toward Enlightenment. One of the early sutras (a collection of sayings attributed to the Buddha forming a religious text) records that the Buddha gave specific directions regarding the appropriate method of honoring his remains (the Maha-parinibbāna sutra): his ashes were to be buried in a stupa at the crossing of the mythical four great roads (the four directions of space), the unmoving hub of the wheel, the place of Enlightenment. If one thinks of the stupa as a circle or wheel, the unmoving center symbolizes Enlightenment. Likewise, the practitioner achieves stillness and peace when the Buddhist dharma is fully understood. Many stupas are placed on a square base, and the four sides represent the four directions, north, south, east and west. Each side often has a gate in the center, which allows the practitioner to enter from any side. The gates are called torana. Each gate also represents the four great life events of the Buddha: East (Buddha’s birth), South (Enlightenment), West (First Sermon where he preached his teachings or dharma), and North (Nirvana). The gates are turned at right angles to the axis mundi to indicate movement in the manner of the arms of a svastika, a directional symbol that, in Sanskrit, means “to be good” (“su” means good or auspicious and “asti” means to be). The torana are directional gates guiding the practitioner in the correct direction on the correct path to Enlightenment, the understanding of the Four Noble Truths. At the top of stupa is a yasti, or spire, which symbolizes the axis mundi (a line through the earth’s center around which the universe is thought to revolve). The yasti is surrounded by a harmika, a gate or fence, and is topped by chattras (umbrella-like objects symbolizing royalty and protection). The stupa makes visible something that is so large as to be unimaginable. The axis symbolizes the center of the cosmos partitioning the world into six directions: north, south, east, west, the nadir and the zenith. This central axis, the axis mundi, is echoed in the same axis that bisects the human body. In this manner, the human body also functions as a microcosm of the universe. The spinal column is the axis that bisects Mt. Meru (the sacred mountain at the center of the Buddhist world) and around which the world pivots. The aim of the practitioner is to climb the mountain of one’s own mind, ascending stage by stage through the planes of increasing levels of Enlightenment. The practitioner does not enter the stupa, it is a solid object. Instead, the practitioner circumambulates (walks around) it as a meditational practice focusing on the Buddha’s teachings. This movement suggests the endless cycle of rebirth (samsara) and the spokes of the Eightfold Path (eight guidelines that assist the practitioner) that leads to knowledge of the Four Noble Truths and into the center of the unmoving hub of the wheel, Enlightenment. This walking meditation at a stupa enables the practitioner to visualize Enlightenment as the movement from the perimeter of the stupa to the unmoving hub at the center marked by the yasti. This video/animation shows the perspective of someone circumambulating the Mahastupa in Sanchi, the soundtrack plays monks chanting Buddhist prayers, an aid in medition. Circumambulation is also a part of other faiths. For example, Muslims circle the Kaaba in Mecca and cathedrals in the West such at Notre Dame in Paris include a semicircular ambulatory (a hall that wraps around the back of the choir, around the altar). The practitioner can walk to circumambulate the stupa or move around it through a series of prostrations (a movement that brings the practitioner’s body down low to the ground in a position of submission). 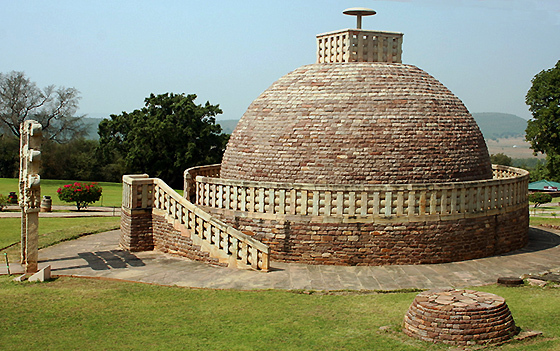 An energetic and circular movement around the stupa raises the body’s temperature. Practitioners do this to mimic the heat of the fire that cremated the Buddha’s body, a process that burned away the bonds of self-hood and attachment to the mundane or ordinary world. Attachments to the earthly realm are considered obstacles in the path toward Enlightenment. Circumambulation is not veneration for the relics themselves—a distinction sometime lost on novice practitioners. The Buddha did not want to be revered as a god, but wanted his ashes in the stupas to serve as a reminder of the Four Noble Truths. Small stupas can function as votive offerings (objects that serve as the focal point for acts of devotion). In order to gain merit, to improve one’s karma, individuals could sponsor the casting of a votive stupa. Indian and Tibetan stupas typically have inscriptions that state that the stupa was made “so that all beings may attain Enlightenment.” Votive stupas can be consecrated and used in home altars or utilized in monastic shrines. Since they are small, they can be easily transported; votive stupas, along with small statues of the Buddha and other Buddhist deities, were carried across Nepal, over the Himalayas and into Tibet, helping to spread Buddhist doctrine. Votive stupas are often carved from stone or caste in bronze. The bronze stupas can also serve as a reliquary and ashes of important teachers can be encased inside. This stupa clearly shows the link between the form of the stupa and the body of the Buddha. The Buddha is represented at his moment of Enlightenment, when he received the knowledge of the Four Noble Truths (the dharma or law). He is making the earth touching gesture (bhumisparsamudra) and is seated in padmasan, the lotus position. He is seated in a gateway signifying a sacred space that recalls the gates on each side of monumental stupas. Cite this page as: Dr. Karen Shelby, "The stupa," in Smarthistory, August 9, 2015, accessed April 19, 2019, https://smarthistory.org/the-stupa/.